“Hundreds of thousands of refugees are living in an extremely precarious situation"
In 2017, MSF continued to provide healthcare to vulnerable people in Bangladesh, and dramatically scaled up its activities to respond to a massive influx of Rohingya refugees from Myanmar. A concerted campaign of violence unleashed by the Myanmar military against the Rohingya in Rakhine state from 25th August 2017 prompted more than 660,000 people to flee across the border into Cox’s Bazar district, Bangladesh, by the end of 2017. This brought the total Rohingya refugee population in the country to over 830,000. Most Rohingya reside in precarious shelters in heavily congested settlements prone to mudslides and flooding, where the hygiene and sanitation conditions are dire, and there is a shortage of clean drinking water. 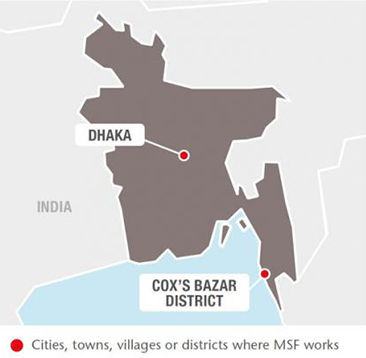 In response to the huge growth in needs, MSF massively scaled up its operations in Cox’s Bazar. By the end of 2017, MSF was managing 19 health posts, three primary health centres and four inpatient facilities. Between July and December, the number of patients seen by MSF teams each day had increased from approximately 200 to over 2,000. The main conditions treated were respiratory tract infections, diarrhoeal diseases and infant malnutrition, which directly correlate with the abject living conditions in the settlements. By the end of the year, thousands of people with suspected cases of measles and diphtheria had sought care at MSF facilities. As well as treating over 2,624 patients for diphtheria, teams started active case investigation in most of the settlements where they worked – to identify further cases, collect information on the number of residents in the patient’s household and on any other contacts made prior to presentation. Contacts of patients with diphtheria were treated prophylactically with antibiotics. MSF opened a number of diphtheria treatment centres, such as in Rubber Garden, near Kutupalong makeshift settlement, where suspected cases could be monitored and treated. MSF increased the number of beds in its existing facilities in Kutupalong and its newly built health facility in Balukhali. A 50-bed hospital opened by MSF in Tasnimarkhola settlement was the only one offering inpatient care in the area. Another inpatient facility scheduled to open near Moynarghona makeshift settlement was still functioning as a t emporary 85-bed diphtheria treatment centre in December. As part of preparedness plans for potential outbreaks of cholera or other diarrhoeal diseases, MSF identified sites for treatment units in Balukhali, Hakimpara, Jamtoli and Unchiprang. 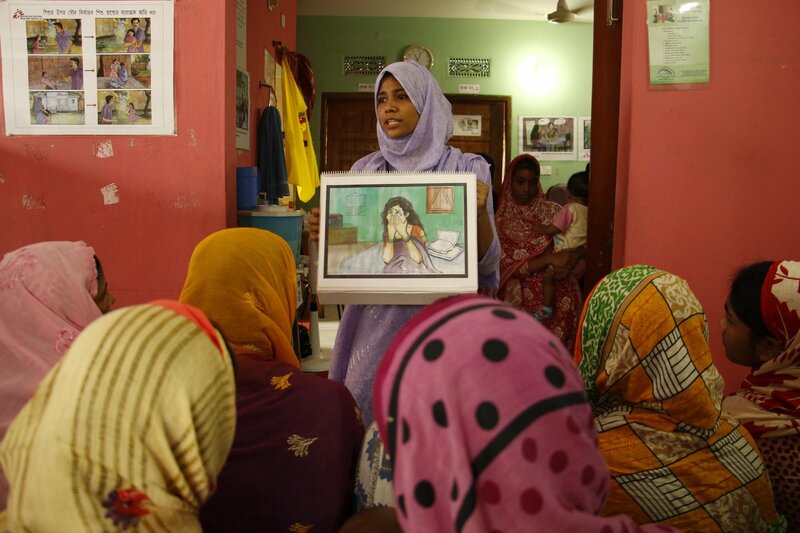 A counsellor gives a talk on sexual violence and intimate partner violence at MSF's women's health clinic.